How about some festive, Nutty Christmas Cookies for day two of the twelve days of Christmas cookies? These shortbread type cookies are full of nuts and frosted with vanilla icing, yummy! Directions: Preheat oven to 300 degrees Fahrenheit. Cream butter with an electric mixer. Add 1/2 cup icing sugar and mix until well blended. Stir in the flour, nuts, salt and vanilla extract and combine well. Drop 1 spoonful of mixture for each cookie onto a greased baking sheet and bake in the oven for about 20 minutes. In the meantime, combine 1 cup of icing sugar and 1 tsp vanilla and place onto a shallow dish. 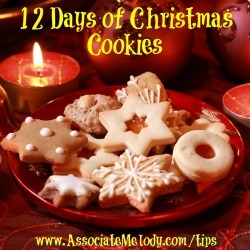 Dip the top of each of the warm cookie with the mixture and set aside to cool. Yields about 5 dozen cookies. I adore any buttery shortbread type cookie. What’s your favorite type of holiday cookies? Don’t be shy, comment below!